My spacious studio is on a 3rd floor with an elevator. Upon entry, there is a large hallway with a walk-in closet and a mud room. From the hall, there is an entrance to a large bathroom with a stand-up shower and a tub. Large open concept room with a "murphy" queen size comfortable bed, allowing for extra space when pushed up, and a fold out sofa bed for an additional 3rd guest, flat-screen TV that can be watched from the beds, a desk and a chair sits below windows. A retro leather- like sofa bed and an oval conference glass table create a comfortable seating area. A bar seating for 2 with a view of the entertainment centre divides the modern kitchen from the living area. The kitchen is equipped with a washer/dryer built in, oven, microwave, large fridge, and a flat cook top. In front of a balcony stands a table and chairs for 2. The apartment has a ceiling fan and central heating. Blinds cover all windows and protect from a direct sun. (very sunny).The apartment has wifi and a local cable. TV has a DVD player built in. Laminate flooring through out.The apartment is directly on transport. (trams allow for site seeing on the ride, unlike metro that is under the ground). There is an easy connect to trains, busses and metro though.It is reasonably quiet ther with sound proofed windows. A french door leads to a small balcony recently completely renovated. It is very clean. Surroundings are green, one can walk all the way to the Vitkov monument through parks. If you wish, take the back entrance to a Balkan street and follow it all the way to Vitkov. There are 2 garden restaurants with a good beer and a snack food in the next door building, Albert and Kaufland across the street is convenient when you want to eat at home. The condo will comfortably sleep 2 ppl, it will fit 3 ppl maximum but it is a squeeze and not recommended. Best for couples. Recently upgraded. New lighting panel above the murphy bed and new bedside tables with built in lighting and storage have been installed recently as a part of upgrading for your increased comfort. Desk drawer has maps and pamphlets of interesting parts of CZ to visit. There is a wonderful trip via train nearby to Kutna Hora that I really recommend. There is a book with written instructions on how to use appliances, TV and remote and also other helpful tips. There is a free street parking, area is safe, have not heard of any break-ins ever. The main door to the apartment has a safety lock, keep it locked if you leave for the whole day. We are keeping track of energy and water use, you are not charged extra unless there is much higher usage than by other guests. Treat my place like your own home, turn off the ceiling fan, appliances and lights before you leave. Please do not let water run through the tub overflow, we have experienced issues with a leak to downstairs. We strive to keep the place comfortable, and in perfect condition. ( if you find an issue that needs an attendance, please let us know )Towels and linen are provided, the kitchen is fully equipped with pots, pressure cooker, lots of cups, glassware, plates and cutlers. The parking has been changed to residential only unfortunately. There is no more free parking available. I love this property, because it gives me all the space I need with all the modern amenities when I want to rest after a full day of visiting and touring around. There is lots of sun and I like to paint so you can imagine I love to come and spend relaxing time in here. My family lives a bike-ride away, and yes, there are areas to cycle through. The property is surrounded by green parks, and lots of trees with play areas for children. The condo is located on an intersection with transportation out of town to lakes, or downtown within minutes. Very easy to get to airport via transit, but I have connections to safe taxi transport for very reasonable price for those that prefer comfort. It is not directly downtown, so you can find parking in front for free, saving money and frustration if coming from nearby countries. The parking could be very costly and the transport on transit is easy and convenient. There is a big shopping centre across the street on the side and a smaller grocery store across the street in front. There are great parks, disc golf and , outdoor summer pool, and a bike root for ppl that like sports. Bathroom has both a standup shower and a bathtub for your convenience. The tram stops in front and takes 20 min. to MAIN train st. & downtown Prague. Bus transits in front - 2 km.- to LIBEN train station, to various tourist locations. A bus depot Sokolovska 2 CZ&Europe. Fridge and freezer with 4 drawers . Some DVD's available left behind by the guests, please bring your laptops or films on USB sticks. There are cheap DVD's for sale in the News stands if you wish to watch films. All the TV is LOCAL. There is a small balcony off the kitchen. We want to thank you for the coffee maker. It made a world of difference. We stayed for 12 days. The tram and the market are within walking distance. It was convenient to buy a ticket and head out to be among the thousands of tourist and do the touristy thing. It was even better to get away from them and come to a space with a kitchen. We hope to come back to Prague and will look to see if Suzanne's place is available before searching someone else's. Thank you for sharing your home with us. It was a pleasure to live among locals. The property was as described in the overview and great for a vacation. I really liked the apartment. It was adequate for my needs as well as sunny and cheerful. The location is not as close to the tourist area as I thought. It is easy to easy to get around using the tram and metro. The grocery store across the street has everything you will need. Zuzanna, the owner is very pleasant and accommodating. I would definitely stay here again if I go back to Prague. For the price this was an excellent choice for us. Don't expect air conditioning and with the windows open it was noisy (3 tram lines). clean and convenient, our stay was so wonderful! The apartment is just as presented and the hostess has been kind and attentive. Thank you so much! Thank you. I am glad you enjoyed your stay. You have been great guests as well. This apartment is as it is described. Sunny, spacious, comfortable and full-furnitured. I have been leaving alone for three months and I feel as it is my own house. I could easily host my friends without feeling that I didn't have my space. Only 2 minutes walking to tram station and 20 minutes by tram to the center of the city. The most important think for me is that it is extremely warm, even it is -17 degrees outside. I would recommend without doubt. Thank you very much for being a great renter and for appreciating what I have to offer. I am glad your study time in Prague was pleasant. The property is very good, clean, excellent location for transport, it has everything you need. Thank you for your review and thank you for extending your stay for another month even though there is the minor noise from the street. I do know the noise goes away when the windows are closed. The positives are that it is on transportation and close to the 2 grocery stores. Thank you for all your feedback during the stay. 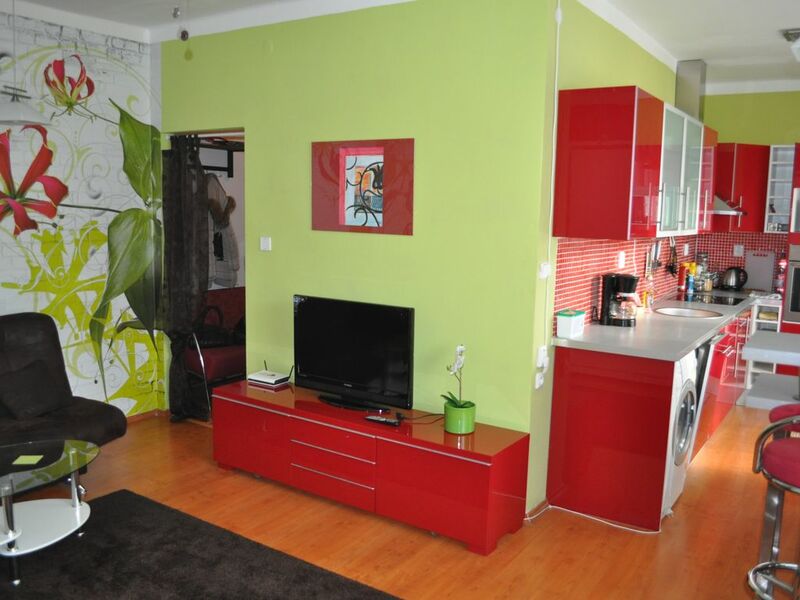 Various parks, disc golf, bike paths, garden restaurants in walking distance, tennis courts, fitness centre at TJ Zizkov in walking distance for members ( longer term rentals ). Price is per night for 2 adults, any additional person pays CAD 31 per night. 3 people maximum.